The Forage Systems Research Center (FSRC) donated ground beef to the Brookfield Ministries Food Pantry, part of The Food Bank for Central & Northeast Missouri. Pictured, from left to right, David Davis, superintendent of FSRC; Debbie Scott, director of the Food Pantry; and Racheal Foster-Neal, office support assistant, FSRC. Photo courtesy David Davis. Every so often the Forage Systems Research Center, located near Linneus, Mo., has a beef animal it can’t bring to the sale barn. There are a variety of reasons for this, including a limp leg or unwanted coat defect. While there is nothing actually wrong with the beef animal, its value at the sale barn is dramatically reduced. Those thoughts led Davis to focus on ways he could use those cows and give back to the local Linn County communities. After a few years of discussing the best way to do that, FSRC is donating 465 pounds of ground beef to the Brookfield Ministries Food Pantry, part of The Food Bank for Central & Northeast Missouri. 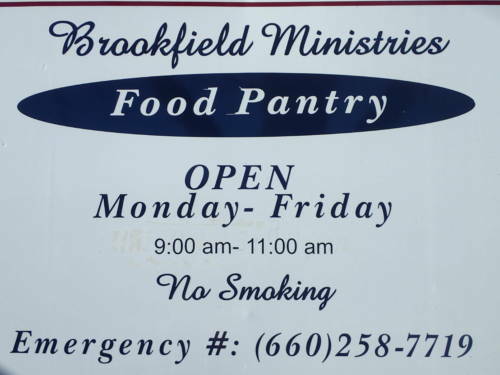 Brookfield Ministries Food Pantry is located in Brookfield, Mo. The group distributes a variety of … Expand ▸Brookfield Ministries Food Pantry is located in Brookfield, Mo. The group distributes a variety of food throughout the Linn County area. Photo courtesy David Davis. The meat had to meet certain rules and regulations to be accepted as a donation, such as coming from an inspected facility. FSRC met all of those requirements. The Brookfield Ministries Food Pantry is located in Brookfield, Mo., about 13 miles southeast of Linneus. The group distributes a variety of food throughout the Linn County area. FSRC worked with Rob King at King Processing and Catering out of Marceline to process and prepare the meat. The Center worked with Director Debbie Scott at the Brookfield Ministries Food Pantry on the actual donation. The meat was packaged in one-pound packages. FSRC gave approximately 450 packages to the pantry. “We thought that one-pound packages of ground beef would be easier to handle and distribute than other cuts of meat,” Davis said. The Food Bank for Central & Northeast Missouri, of which the Brookfield Ministries Food Pantry is a part, serves 32 counties in the state and distributes millions of pounds of food each year. There are a variety of ways to give back, either through giving, donating or volunteering.